The House Committee on Un-American Activities (HUAC or HCUA 1934–1975) was an investigative committee of the United States House of Representatives. In 1969, the House changed the committee's name to "House Committee on Internal Security." When the House abolished the committee in 1975, its functions were transferred to the House Judiciary Committee. While the committee was charged with finding subversive activities of radical groups on both the political left and right, it is best known for its investigations of the motion picture industry in the late 1940s and 1950s. It focused on the communist sympathies of many of the writers, actors and directors within the Hollywood film community, giving rise to the creation of a Hollywood blacklist of those who were prohibited from working in the film industry for more than a decade. The work of the committee was influenced by the era of McCarthyism which sought to expose the perceived infiltration of prominent aspects of American society by communists who sought the overthrow and breakdown of American society. However, their work is now generally understood to have far exceeded their mandate, punishing people for their political beliefs. From 1934-37, the Special Committee on Un-American Activities Authorized to Investigate Nazi Propaganda and Certain Other Propaganda Activities, chaired by John W. McCormack and Lithuanian-born Samuel Dickstein (1885–1954), held public and private hearings in six cities, questioned hundreds of witnesses and collected testimony filling 4,300 pages. Its mandate was to get "information on how foreign subversive propaganda entered the U.S. and the organizations that were spreading it." The committee investigated and supported allegations of a fascist plot to seize the White House, known as the Business Plot. It was replaced with a similar committee that focused on pursuing communists. Its records are held by the National Archives and Records Administration as records related to HUAC. 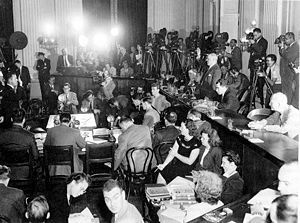 In May 1938, the House Committee on Un-American Activities was established as a special investigating committee. It was chaired by the U.S. Congressman from Texas Martin Dies, Jr., and Rep. Samuel Dickstein from New York, and became known as the "Dies Committee." Its work was aimed mostly at German-American involvement in Nazi and Ku Klux Klan activity. However, little was done in the way of investigations into the activities of the Klan. When the committee's chief counsel, Ernest Adamson, announced that "The committee has decided that it lacks sufficient data on which to base a probe," committee member John E. Rankin added: "After all, the KKK is an old American institution." HUAC instead concentrated on investigating the possibility that the American Communist Party had infiltrated the Works Progress Administration, including the Federal Theatre Project. The Dies Committee also carried out a brief investigation into the wartime internment of Japanese Americans living on the West Coast. The investigation primarily concerned security at the camps, youth gangs allegedly operating in the camps, food supply questions, and releases of internees. With the exception of Rep. Herman Eberharter, the members of the committee seemed to support internment. In 1938, Hallie Flanagan, the head of the Federal Theatre Project, was subpoenaed to appear before the committee to answer the charge that the project was overrun with communists. Flanagan was called to testify for only a part of one day, while a clerk from the project was called in for two entire days. It was during this investigation that one of the committee members, Joe Starnes, famously asked Flanagan whether the Elizabethan playwright Christopher Marlowe was a member of the Communist Party, and mused that "Mr. Euripides" preached class warfare. In 1939, the committee investigated leaders of the American Youth Congress, a Comintern affiliate organization. Ironically, in the 1990s it was revealed that Congressman Samuel Dickstein, vice-chairman of the respective committees, was himself named in Soviet NKVD documents as a paid informant for three years. They dropped him from the payroll when he left the committee in 1940. The House Committee on Un-American Activities became a standing (permanent) committee in 1945. Representative Edward J. Hart of New Jersey became the committee's first chairman. Under the mandate of Public Law 601, passed by the 79th Congress, the committee of nine representatives investigated suspected threats of subversion or propaganda that attacked "the form of government guaranteed by our Constitution." Under this mandate, the committee focused its investigations on real and suspected communists in positions of actual or supposed influence in American society. The first such investigation looked into allegations of communists in the Federal Theatre Project in 1938. A significant step for HUAC was its investigation of the charges of espionage brought against Alger Hiss in 1948. This investigation ultimately resulted in Hiss's trial and conviction for perjury, and convinced many of the usefulness of congressional committees for uncovering communist subversion. In 1947, the committee held nine days of hearings into alleged communist propaganda and influence in the Hollywood motion picture industry. After conviction on contempt of Congress charges for refusal to answer some questions posed by committee members, the "Hollywood Ten" were blacklisted by the industry. Eventually, more than 300 artists—including directors, radio commentators, actors and particularly screenwriters—were boycotted by the studios. Charlie Chaplin, who openly supported the Soviet Union, returned to England to find work. Others wrote under pseudonyms or the names of colleagues. Only about 10 percent succeeded in rebuilding careers within the entertainment industry. In 1947, studio executives told the committee that wartime films—such as Mission to Moscow, The North Star, and Song of Russia—could be considered pro-Soviet propaganda, but claimed that the films were valuable in the context of the Allied war effort, and that they were made (in the case of Mission to Moscow) at the request of White House officials. In response to the House investigations, most studios produced a number of anti-communist and anti-Soviet propaganda films such as John Wayne's Big Jim McLain, Guilty of Treason (about the ordeal and trial of József Cardinal Mindszenty), The Red Menace, The Red Danube, I Married a Communist, and Red Planet Mars. I Was a Communist for the FBI, was nominated for an Academy Award for the best documentary in 1951 and also serialized for radio. Universal-International Pictures was the only major studio that did not produce such a film. In the wake of Senator McCarthy's downfall, the prestige of HUAC began a gradual decline beginning in the late 1950s. By 1959, the committee was being denounced by former President Harry S. Truman as the "most un-American thing in the country today." In May 1960, the committee held hearings in San Francisco that led to the infamous "riot" at City Hall on May 13, 1960, when San Francisco police officers fire-hosed students from Berkeley, Stanford, and other local colleges down the steps beneath the rotunda. An anti-communist propaganda film, Operation Abolition, was produced by the committee from subpoenaed local news station reports and shown around the country during 1960 and 1961. In response, the Northern California chapter of the ACLU produced a film called Operation Correction, which discussed falsehoods in the first film. The committee lost considerable prestige as the 1960s progressed, increasingly becoming the target of political satirists and the defiance of a new generation of political activists. HUAC subpoenaed Jerry Rubin and Abbie Hoffman of the Yippies in 1967, and again in the aftermath of the 1968 Democratic National Convention. The Yippies used the media attention to make a mockery of the proceedings. Rubin came to one session dressed as an American Revolutionary War soldier and passed out copies of the United States Declaration of Independence to people in attendance. Rubin then "blew giant gum bubbles while his co-witnesses taunted the committee with Nazi salutes." Hoffman attended a session dressed as Santa Claus. On another occasion, police stopped Hoffman at the building entrance and arrested him for wearing an American flag. Hoffman quipped to the press, "I regret that I have but one shirt to give for my country," paraphrasing the last words of revolutionary patriot Nathan Hale; Rubin, who was wearing a matching Viet Cong flag, shouted that the police were communists for not arresting him also. The committee's anti-communist investigations are often confused with those of Senator Joseph McCarthy. McCarthy, as a senator, had no direct involvement with this House committee. Still, the name of the committee is forever linked with the era of McCarthyism and with the spirit of intolerance that is associated with it. While the opening of the KGB archives after the collapse of the Soviet Union has demonstrated that there were ongoing efforts to infiltrate America, the notion that Americans with communist sympathies were not good Americans became unacceptable during the 1960s and beyond. The work of the committee is now generally understood to violate a basic tenant of the United States Bill of Rights—freedom of conscience. ↑ Benedict Nightingale, September 18, 1988, "Mr. Euripides Goes To Washington" book review of Hallie Flanagan: A Life in the American Theatre, by Joanne Bently, The New York Times. Retrieved January 19, 2009. ↑ Allen Weinstein and Alexander Vassiliev, The Haunted Wood: Soviet Espionage in America—The Stalin Era (New York: Modern Library, ISBN 0375755365), 140–150. ↑ Walter Goodman, The Committee (New York: Farrar, Straus and Giroux, 1968). ↑ Doug Lindner, Famous Trials: The Alger Hiss Trials—1949-50, 2003, University of Missouri, Kansas City Law Faculty. Retrieved January 19, 2009. ↑ IMDB, I Was a Communist for the FBI, 1951, Retrieved January 26, 2009. ↑ Dan Georgakas, Hollywood Blacklist, in: Encyclopedia Of The American Left, 1992. Retrieved January 19, 2009. ↑ Stephen J. Whitfield, The Culture of the Cold War (Baltimore: The Johns Hopkins University Press, 1996). ↑ Time, Operation Abolition. Retrieved January 19, 2009. ↑ BookRags, Youth International Party. Retrieved January 19, 2009. ↑ Jerry Rubin, A Yippie Manifesto. Retrieved January 19, 2009. ↑ Thomas Geogheghan, "By Any Other Name. Brass Tacks," February 24, 1969, The Harvard Crimson. Retrieved January 19, 2009. ↑ Thomas Patrick Doherty. Cold War, Cool Medium: Television, McCarthyism, and American Culture. (New York: Columbia University Press, 2003), 15-16. Bentley, Eric & Frank Rich. 2002. Thirty Years of Treason: Excerpts from Hearings Before the House Committee on Un-American Activities, 1938-1968. New York: Nation Books, ISBN 1560253681. Buckley, William F. 1962. The Committee and Its Critics; a Calm Review of the House Committee on Un-American Activities. Putnam Books, OCLC 457047. Buhle, Mari Jo, Paul Buhle, and Dan Georgakas (eds.). Encyclopedia of the American Left. Urbana and Chicago: University of Illinois Press, 1992. Doherty, Thomas Patrick. Cold War, Cool Medium: Television, McCarthyism, and American Culture. New York: Columbia University Press, 2003. ISBN 0231129521. Donner, Frank J. 1967. The Un-Americans. Ballantine Books OCLC 2484217. Gladchuk, John Joseph. 2006. Hollywood and Anticommunism: HUAC and the Evolution of the Red Menace, 1935-1950. New York: Routledge, ISBN 0415955688. Goodman, Walter. 1968. The Committee: The Extraordinary Career of the House Committee on Un-American Activities. Farrar Straus & Giroux. ISBN 0374126887. Kirschner, Don S. Cold War Exile: The Unclosed Case of Maurice Halperin. University of Missouri Press, 1995. ISBN 0826209890. Navasky, Victor S. Naming Names. Hill and Wang, 2003. ISBN 0809001837. O'Reilly, Kenneth. 1983. Hoover and the Unamericans: The FBI, HUAC, and the Red Menace. Philadelphia: Temple University Press, ISBN 0877223017. Weinstein, Allen, and Alexander Vassiliev. 1998. The Haunted Wood: Soviet Espionage in America—The Stalin Era. New York: Modern Library, ISBN 0375755365. Whitfield, Stephen J. 1996. The Culture of the Cold War. Baltimore: The Johns Hopkins University Press, ISBN 0801851955. All links retrieved January 14, 2018. History of "House Un-American Activities Committee"
This page was last modified on 14 January 2018, at 16:09.